This is an enjoyable light race game, with an innovative catch-up mechanism. Some may find it a bit abstract, but I think the theme is well implemented. Simple game that is always a hit with gamers and non-gamers. Great theme. Advanced, Pirate, Candyland. It's as if someone hit their head and decided to make a Candyland a gamer would be willing to play. Easy to teach, fast to play, plenty of room for tactics and strategy. A win-win all around. Did I mention Advanced Pirate Candyland? 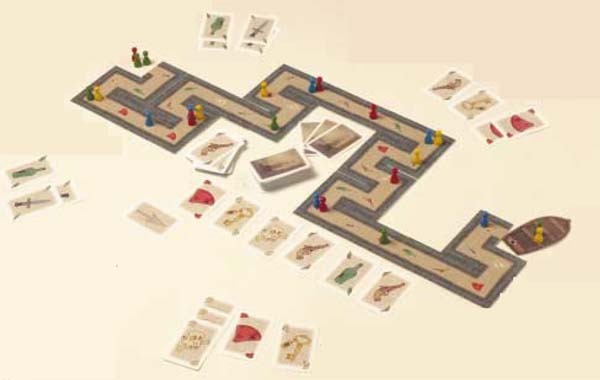 Cartagena is a race game which stands out because of it's innovate and clever movement mechanism. You use cards to advance, but you have to go backwards to gain more cards. The trick then becomes to use your cards at the right time, which feels a bit like a puzzle and is great fun. Highly recommended as a family game or for people relatively new to gaming.